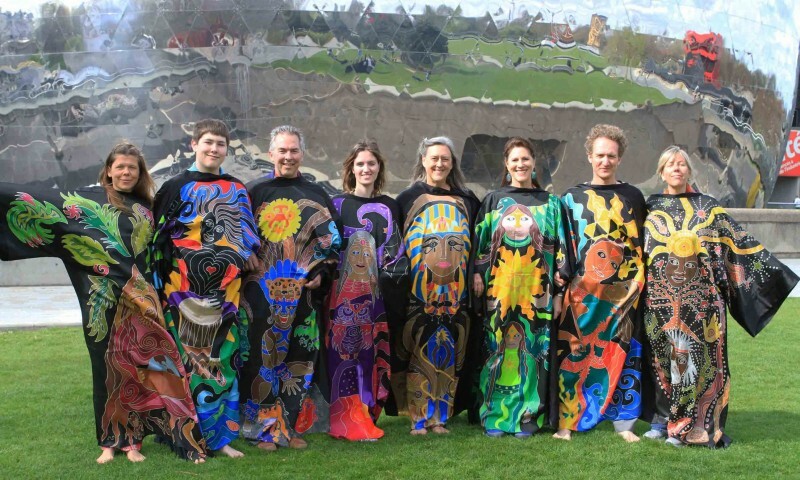 The 33 Robes represent 33 different spiritual elders from many diverse cultural and spiritual traditions. 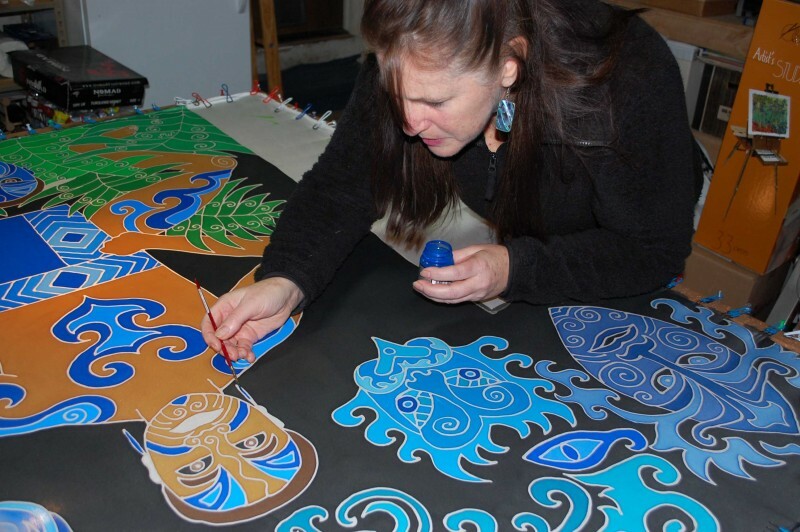 This project began many years ago during my early childhood, when I was exposed to many different kinds of art; from folk art to fine art, shamanic art, modern art and fiber art. Later, I became fascinated with sacred art and how it is used to induce altered states of consciousness. My interest in sacred art has inspired numerous trips to international centers of art and culture and for years I have researched how sacred art activates the awakening and healing of the soul. All of these experiences led me to create 33 Sacred Robes for ceremony, ritual, initiation and healing. Many people who wear the robes have experienced deep healing, powerful shifts in their energetic field, chakra clearing and spontaneous awakenings. In my home as a child I was surrounded by sacred images from Africa, Asia, Oceania, North and South America. This beautiful and mysterious art, depicting mystical journeys, unconscious dream states and indigenous cosmology became gateways for my imagination, transporting me to other times and other places. It was only later, when I trained in depth psychology and mysticism, that I understood the deeper function of sacred art – to induce altered states of consciousness so we can connect to our divine nature and other dimensions of reality. Sacred art as a portal. Sacred Art opens a gateway or portal to other dimensions, so the artist needs to be in a sacred or spiritual frame of mind when creating. When the piece of art is infused with the artist’s spiritual intention, then the icon, the stone statue or the sacred robe can come alive and facilitate an experience of Spirit. Traveling the world and witnessing sacred initiations and rites of passage from various cultures, inspired me to find a new medium to teach the Western path of initiation. I wanted to find a creative approach to help my students and clients experience the initiation process in a more embodied way. This led me to create a series of ceremonial robes that would tell a visual story of the archetypal initiation journey, robes that could be worn in ritual as well as contemplated as sacred art. 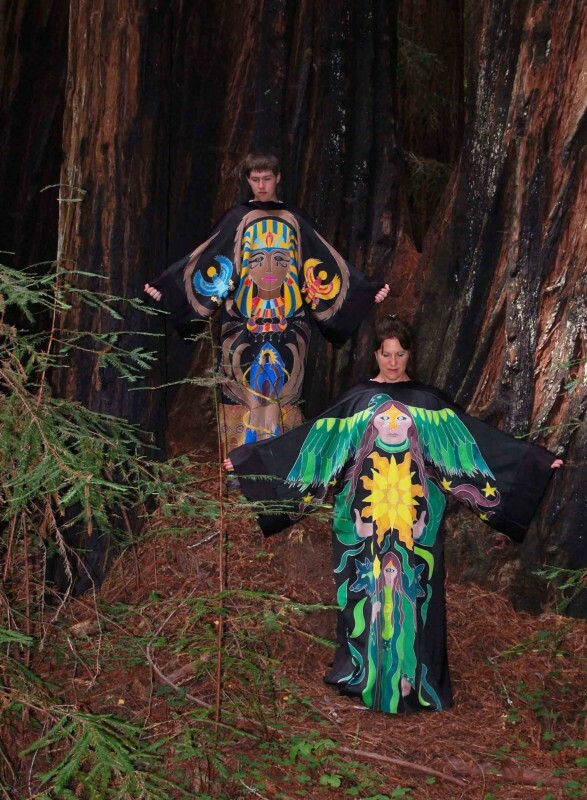 I knew from the Shamanic tradition that the Shaman’s robe tells a visual story of the initiate’s sacred journey. The Shaman’s robe is decorated with the symbols received through dreams and visions during vision quests. The initiate then makes and dons the robe as a sign that initiation is complete. 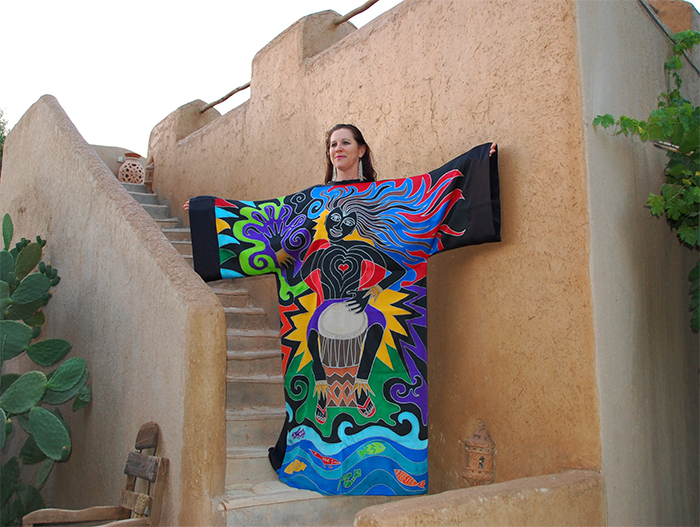 The sacred robe is said to bring power, protection, healing, and illumination. This seemed the perfect medium to show the movement of the Soul through different stages of initiation on its journey of awakening. The robe as a sacred symbol is found in many traditions. 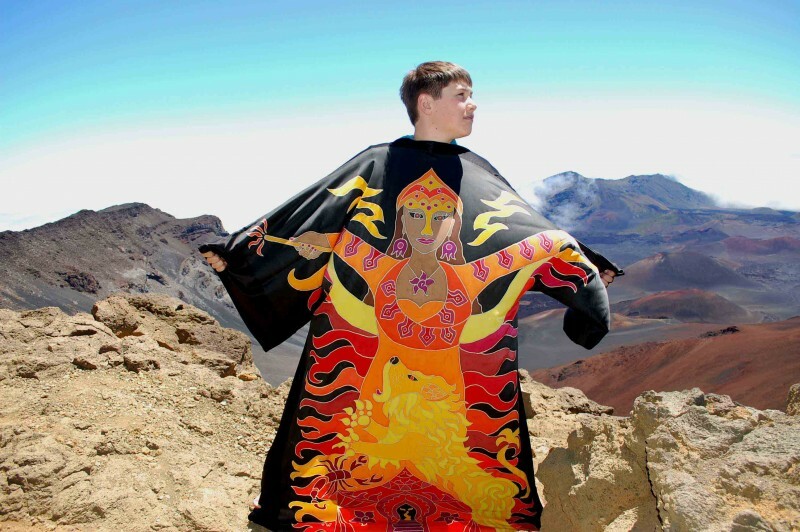 The Gnostics and Jewish mystics use the robe as an image to symbolize the sacred marriage between the Soul and God and between earth and heaven. The Christian mystics believe Jesus to be the Robe of Light who surrounds and illuminates the initiate, awakening their true divine nature. Modern depth psychology would see the donning of the sacred robe as a way to unify the separate parts of the personality so that the psyche can experience itself as whole. 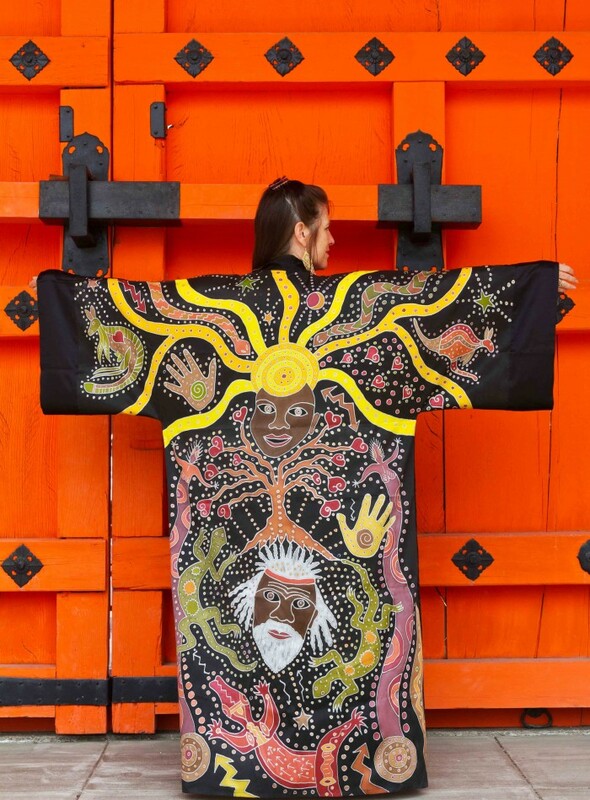 Although the images on the robes can be contemplated or used for imaginary journeys, the possibility that they can be animated by a living human being creates an immediate dialogue between the robe and potential initiate. Each robe desires to come alive through creative ritual and ceremony by a seeker who is willing to take the soul journey. For 17 years now, I have been traveling and teaching with my Sacred Robes. Hundreds of people have tried them on, performed rituals and sacred ceremonies, danced, drummed and chanted in the Sacred Robes. They have been to sacred sites in Crete, Hawaii, Italy, France, Spain, England, Scotland, Morocco, Turkey, Mexico, Thailand, Gambia West Africa and Japan so far. They have been blessed by ancient stone circles, temples and sacred groves. It’s hard to describe the feeling when you wear the robes in sacred ceremony. During ritual, I have heard amazing wisdom come forth from the most ordinary people. The archetypal image on the robe begins to speak and ancient wisdom comes pouring forth! The robes are like channels of information, gateways to the ancient and perennial Wisdom of the Ages. The robes link us with our higher wisdom and to the place of Divine Source. Sometimes the person wearing the robe becomes the Oracle, giving answers, posing questions and dispensing wisdom. How are the Robes Created? Many people want to know how I make the Sacred Initiation Robes. They are made of 100% silk and are handmade for each person. 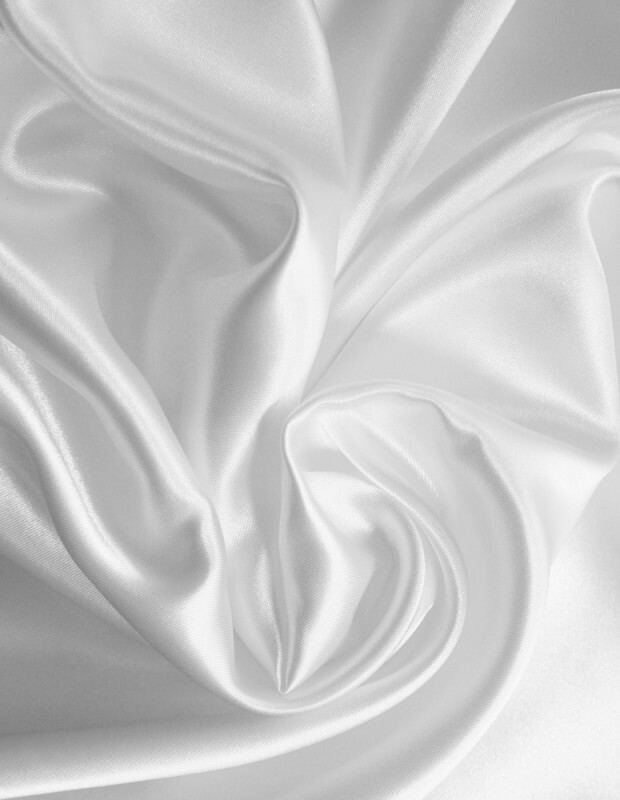 I begin with a large piece of white silk. 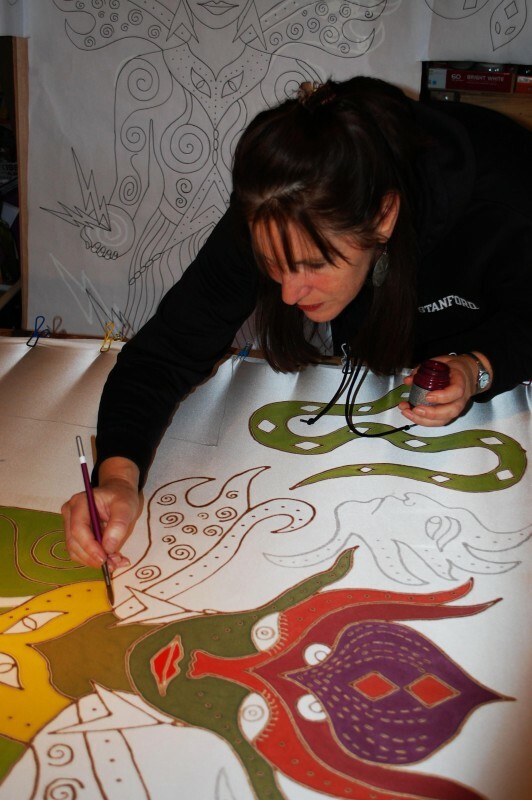 I then trace the life size image onto the silk, stretch it onto a huge stretcher in my studio. Next I go to work outlining the designs with a “gutta” resist – similar to the waxing in Batik making. Then I begin coloring the design with silk paint. After the design is complete, I then dye the entire background black with 2 coats to really saturate the color. The front of the robe is 100% thick black silk. Each of the 33 robes has a unique design and color scheme, which I carefully chose over time with the help of dreams, prayer and meditation. 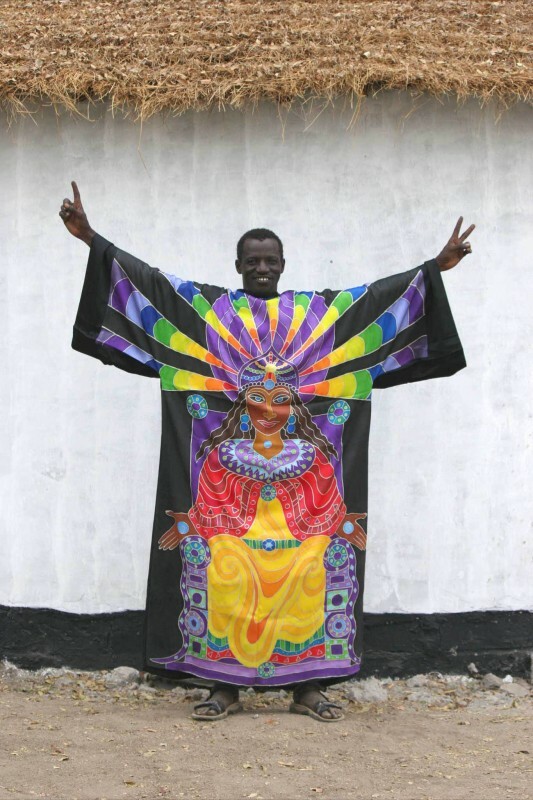 The images on each robe are influenced by my years of personal analysis and dream work, alchemical study, world mythology and extensive traveling investigating cross-cultural expressions of the sacred. Some of the designs came fully formed in dreams. Some designs evolved over time as I was actually drawing the complex blueprint. 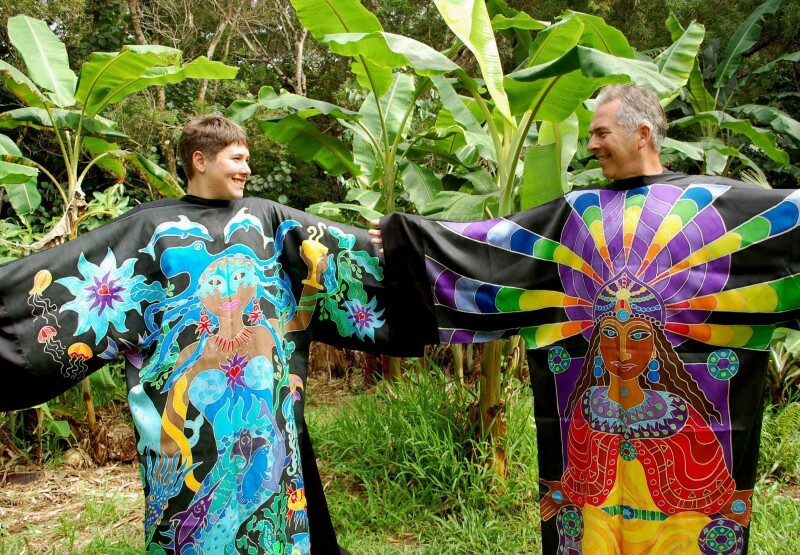 Each Robe is hand painted exclusively for you and takes one month to complete. You can see all 33 designs here.